The ship returned to America by the way of China, and arrived at New-Haven early in the fall of 1809. On their arrival on the continent, Hopu was given an additional name Thomas. “After Hopoo had lived for a season in New-Haven, his disposition seemed inclined rove than to study. He rejected an invitation of Obookiah to go with him to Andover and be taught.” (ABCFM) However, he learned to write and spell some basic words. He chose the life of a sailor – he served on an American ship in the War of 1812. On October 23, 1819, the Pioneer Company of American Protestant missionaries set sail on the Thaddeus for the Islands. These included two Ordained Preachers, Hiram Bingham and his wife Sybil and Asa Thurston and his wife Lucy; two Teachers, Mr. Samuel Whitney and his wife Mercy and Samuel Ruggles and his wife Mary; a Doctor, Thomas Holman and his wife Lucia; a Printer, Elisha Loomis and his wife Maria; a Farmer, Daniel Chamberlain, his wife and five children. They reached Hawaii on March 30, 1820. When the boat which they had sent to a landing on the Kohala coast, returned to the vessel, these were the tidings given to the missionaries: “Kamehameha is dead; his son Liholiho is king. The tabus are at an end; the idols are burned; the temples are destroyed. There has been war. Now there is peace.” (HEA) They later landed in Kailua-Kona, April 4, 1820. Hopu declared “since the Almighty has excited in my heart such yearnings for her, I think it is his will that I marry her.” Lucy Thurston named her Delia. 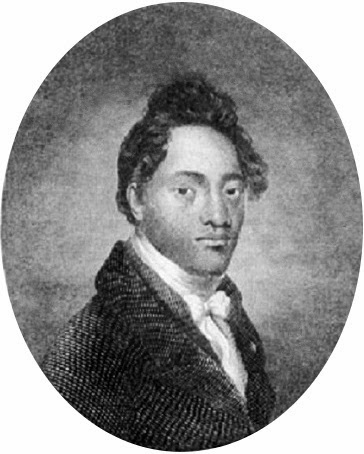 Chester Lyman, visiting the islands in 1846 found Hopu working in a store in Honolulu. He reports he was over 50 and an interesting man. He has been a consistent and useful man since he returned and is now one of the deacons of the Kailua Church where he resides. (Kelley) The image shows Thomas Hopu.